Watch out, textbook industry. The Kindle is coming for you. When Amazon announced the Kindle Paperwhite on Sept. 6, I pre-ordered one right away. Because so much of my time is spent on the computer and smartphone, I don’t read as much as I’d like. The Kindle has solved that, making books, articles and other content readily accessible. For college students, e-readers offer the opportunity to rent or buy textbooks at a reduced cost. While digital textbooks haven’t yet reached critical mass on campus, their adoption is growing. With Amazon’s Kindle Textbook Rental program, students can rent electronic textbooks for as little as 30 days, and are charged only for the time they keep the book. It’s important to note that the Kindle Paperwhite is not a tablet. It’s an e-reader, designed for reading, not tweeting or e-mail. I’ve had mine for just over a month now, long enough to have read several books and refine my opinion of my first e-reader. 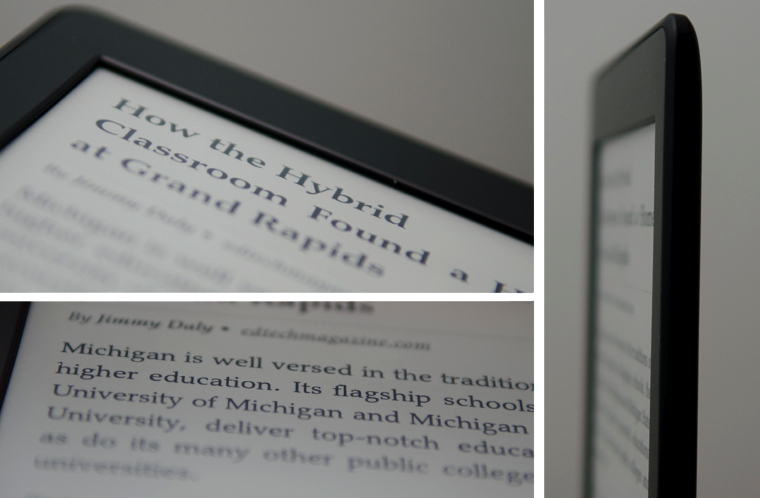 The Paperwhite took a page from Barnes & Noble’s Nook e-book by incorporating a front-lit screen. Using LEDs along the bottom edge of the screen, the Kindle glows rather than glares. Reading in the dark is easy, especially compared with the backlit screens of smartphones and tablets. It actually feels like paper. The matte finish is designed to prevent glare (which it does very well), but it also gives a rough feel, reminiscent of a printed page. “Crisp, dark text against a brilliant white background” is how Amazon describes its product, and I agree. It’s what makes books and content so readable on the Kindle Paperwhite. The fine details of each letter are 25 times sharper than on previous Kindles. Such clarity is refreshing for tired eyes that have gazed for hours into a computer monitor. The screen is 6 inches, measured diagonally, and the entire device is as thin as a pencil. Personally, I wouldn’t mind a larger screen because I’d prefer a larger font size to limit eyestrain. But the smaller device fits nicely in one hand. This device seems almost too light when it’s first taken out of the box. But at just 7.5 ounces, it’s easy to read with one hand, especially when you are lying down. When you buy a smartphone, tablet or e-reader, you buy into the ecosystem as well. The hardware really shines on the Paperwhite, but so does the environment. The selection of books is unmatched, the prices are fair, and the buying process is fast. So far, every book I’ve wanted has been easy to access. Don’t compare the Kindle with iOS 6 or Android’s Jelly Bean. The software on the Kindle is not loaded with features — and it shouldn’t be. The screen is designed specifically for reading, not touching, pinching and swiping. Such functionality would only distract the reader. The Kindle’s software is responsive, and does well what it was built to do: deliver books easily and help the reader navigate them quickly. This is a non-issue. Books download quickly over Wi-Fi, and the brief delay when flipping pages is still faster than turning a physical page. The battery can only be described as amazing. Why? Because it lasts for 8 weeks. If you use your Kindle for roughly 30 minutes a day, you will have to recharge only 6 times a year. I use mine much more than that, and have only recharged once in the past month. The Kindle Paperwhite is competitively priced at $119, with “special offers.” This means that advertisements display on the screen when you aren’t reading. For an extra $20, you can remove the ads, but I don’t find them to be intrusive. Overall, Amazon scored a home run with the Paperwhite. The few features that I’d consider “cons” — an experimental browser and the low-resolution photos that are displayed with articles — are hardly enough to dampen my enthusiasm for this e-reader. There are other great features as well, like the ability to receive PDF files, Microsoft Word documents and just about any web article that I want on the device. See the Amazon product page for full details and specs and check out more Amazon products on CDW•G.